The company that would become Masmy appeared in the early 1950s as Takagawa Kōki Seisakusho (高川光機製作所), based in Kamiikegami, Tokyo. 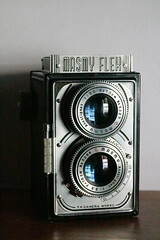 It made the Semi Masmy 4.5×6 folder from 1951, and the Masmy Flex 6×6 TLR from 1952. By mid 1955, the company had renamed itself Masmy Kōki Seisaku K.K. (マスミー光機製作㈱), at the same address, and was making a variety of camera accessories. ↑ Its address in 1953 was Tōkyō-to Ōta-ku Kamiikegami-chō 1091 (東京都大田区上池上町1091). 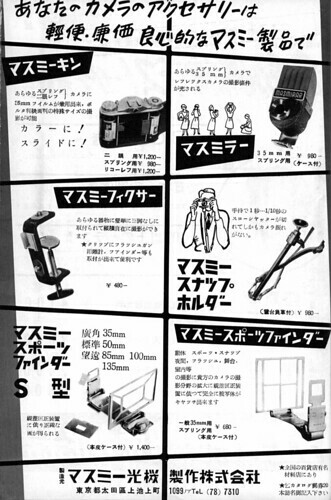 Source: advertisement dated May 1953 reproduced in Kokusan kamera no rekishi, p.183. ↑ Table in the June 1955 special issue of Photo Art, p.156, and advertisements in the June and October 1955 special issues of the same magazine. ↑ Finder observed in an online auction. ↑ 4.0 4.1 4.2 4.3 Advertisement in the June 1955 special issue of Photo Art, p.125. ↑ 5.0 5.1 5.2 5.3 5.4 5.5 5.6 5.7 5.8 Advertisement in the October 1955 special issue of Photo Art, p.158. ↑ Name inferred from the katakana ボルダプター. ↑ Name inferred from the katakana フィクサー. Photo Art rinji zōkan: Kamera akusesarī zensho (フォトアート臨時増刊・カメラアクセサリー全書, Photo Art special issue: All the camera accessories). June 1955, no.80 of the magazine. Advertisement by Masmy Kōki Seisaku on p.125. Photo Art rinji zōkan: Kamera no chishiki (フォトアート臨時増刊・カメラの知識, Photo Art special issue: Knowledge of cameras). October 1955, no.87 of the magazine. 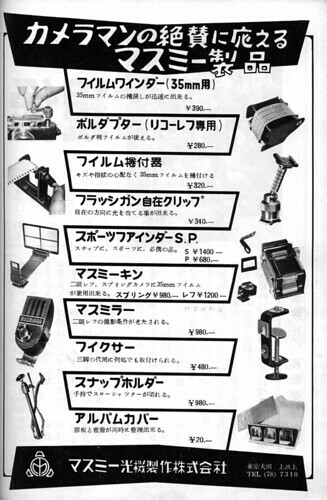 Advertisement by Masmy Kōki Seisaku on p.158. This page was last edited on 10 March 2019, at 18:32.